Mark your calendars for history in the making at ISP as we gather to celebrate the first United Women's Conference "United for a Future of Equality"
The first event United Women's Conference is inspired by the organization's slogan "United for a Future of Equality." The main goal is to raise awareness regarding the issues women face in today's society, in order to inspire and empower the audience to unite and address these injustices. Lara Blanco: how UN Women works to combats the inequalities faced by women in today’s society. Nancy Andrade Castro: being a career woman, mother and wife, and the balance that comes with it. Patty Lezcano: domestic violence in her life. Santiago Tovar: the importance of having empowered female role models while growing up. Gabriella Barratt: the misinterpretations of the word “feminist” and what important feminists have taught her. And a surprise guest speaker to be confirmed. Apart from the speeches, there will also be 3 performances (one dance, and two singing), and three interactive activities. Additionally, during the breaks and before and after the conference, the team will be selling some of its merch, which includes shirts and stickers (these can be found on the Instagram page and can be ordered before the conference as well). There will also be a stand from Hecha y Derecha, which is an organization that helps less-privileged women get money for their small businesses by helping them sell donated clothes in their communities. During the conference, they will be accepting donations of clothes and accessories and will also be selling some of their best donations at great prices. The team will be encouraging all people attending the conference to bring at least one item to donate. Finally, thanks to one of our sponsors, Decameron, we will be holding a raffle on the day of the conference for a certificate of two nights at the Decameron hotel in Playa Blanca. Each raffle ticket has a price of 5$ and can be purchased when buying the tickets or any day prior to the conference. United Women explores the ideas of gender inequality while focusing on women’s rights and ways to stand up for them. United Women is a nonprofit student club at the International School of Panama, founded by Claudia Hernandez, with a goal of raising awareness on the injustices faced by women in today’s society. It focuses on the slogan of “United for a Future of Equality”, as it wants to work towards a future where men and women have equal opportunities. Not only this, but United Women also has different goals in regards to what they want to achieve. It is divided into three main branches focused on addressing these injustices through different approaches: “Combating Violence Against Women”, “Empowering Women”, and “Starting Conversations”. The “Combating Violence Against Women” team is currently working on the first ever United Women conference. This conference will be dedicated to raising awareness of the struggles of gender discrimination within the Panamanian community. Through different speeches and activities, the team hopes that the conference will inspire the audience to join the club on its fight for a future of equality. The conference will welcome eight guest speakers, two of whom are students and two of whom are men. These speakers will address the issue of gender inequality by either speaking from their own experiences or about things they have learned throughout their lifetime or in their career. Topics varying from the definition of the word “feminist”, to the importance of empowered female role models, to domestic violence, to discrimination in the workplace, among others, will be addressed in the different speeches. The diversity of speakers is meant to shed a light on the fact that everyone is subject to these injustices and that men, too, can be feminists and join the fight for equality. United Women has invited other schools in the country to attend the conference, like Balboa Academy, Brader, and Las Esclavas. These schools will have the opportunity to attend the first ever United Women conference and endorse the rights of both genders. Through this, the team hopes to inspire students from these schools to open their own United Women club so that, together, they can all form a network that is united for a future of equality. One of United Women’s main objectives is to create a sense of unity in the conference where everyone feels welcome and empowered to fight against these issues. The conference will be held on April 24th at the International School of Panama’s Performing Arts Center from 12:30 to 5:30 p.m. Tickets to the conference have a cost of 10$, which include food and access to the conference. 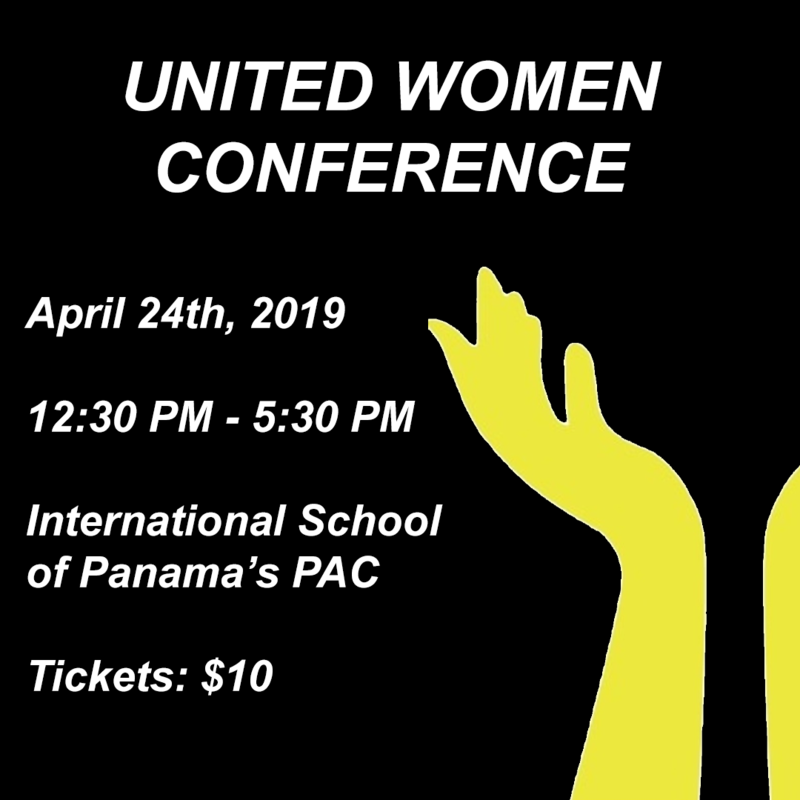 If you would like more information on the conference or would like to purchase a ticket, you can contact the team through Instagram @unitedwomenpty or email: unitedwomenproject@gmail.com.